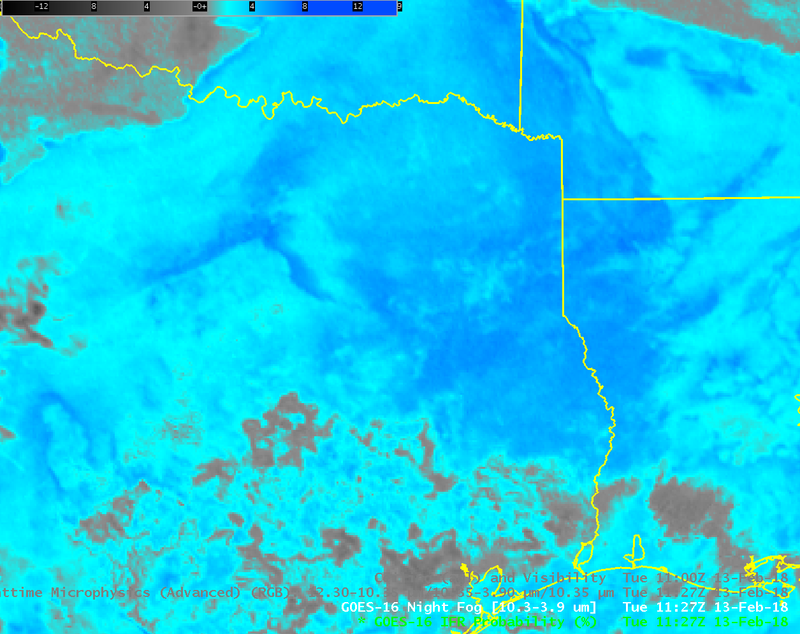 GOES-16 IFR Probability fields on 13 February at 1127 UTC, above, suggest a clear difference in sky conditions between northeast Texas, where IFR Probabilities are very high, and where IFR conditions are widespread, and north-central Texas, around Dallas, where IFR Probabilities are small, and where ceilings and visibilities do not match IFR Conditions. 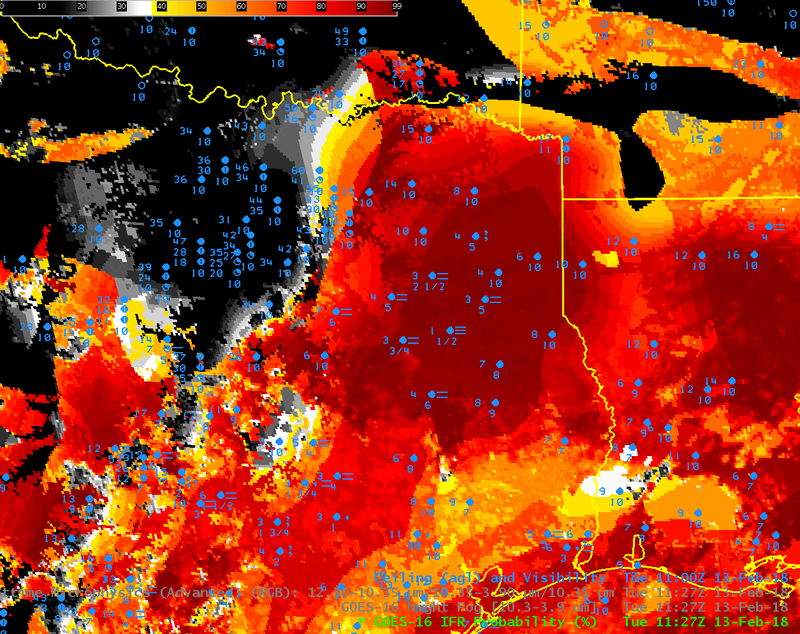 In contrast, the Brightness Temperature Difference field, below, (and the Nighttime Microphysics Red/Green/Blue product, shown here in a toggle with the Brightness Temperature Difference field) shows little difference in signal between the region of IFR conditions over northeast Texas and non-IFR conditions over Dallas and environs. 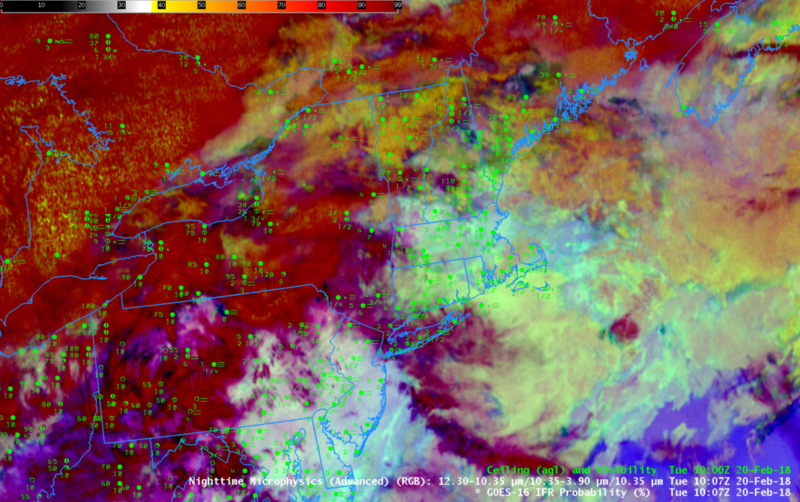 GOES-16 views the top of the cloud, and a region of fog and a region of stratus can look very similar in the Night Fog Brightness Temperature Difference. 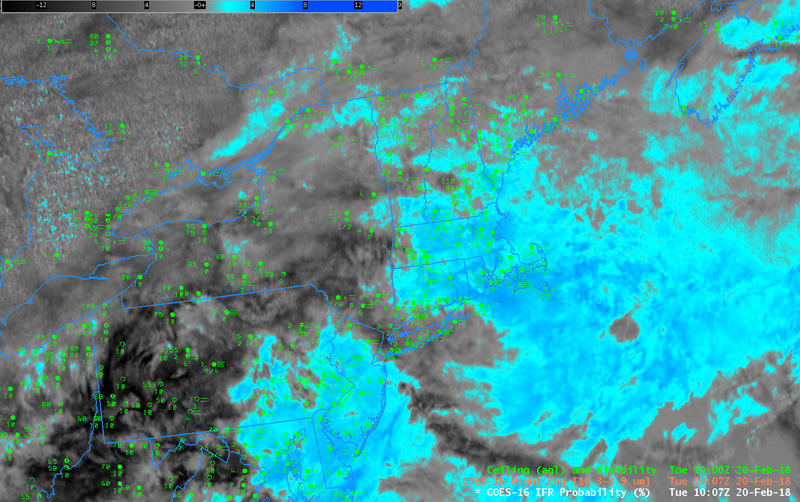 Because IFR Probability fields fuse satellite observations of low clouds with Numerical Model Output estimates of near-surface saturation, IFR Probabilities can differentiate between regions of elevated stratus (where near-surface saturation is not suggested by the model), such as near Dallas, and regions of stratus that is obstructing visibility (where near-surface saturation is suggested by the model). A toggle of all three fields is shown at the bottom of this post. This entry was posted in GOES-16, Multiple Cloud Layers, Texas on February 13, 2018 by Scott Lindstrom.